It is not generally known but Hamilton Harriers is one of Scotland’s oldest athletic clubs, having been founded in 1896. A successful club for many years it could be again given the number of good athletes it produces. We can begin this profile by reproducing an article from the ‘Scots Athlete’ of June 1947. 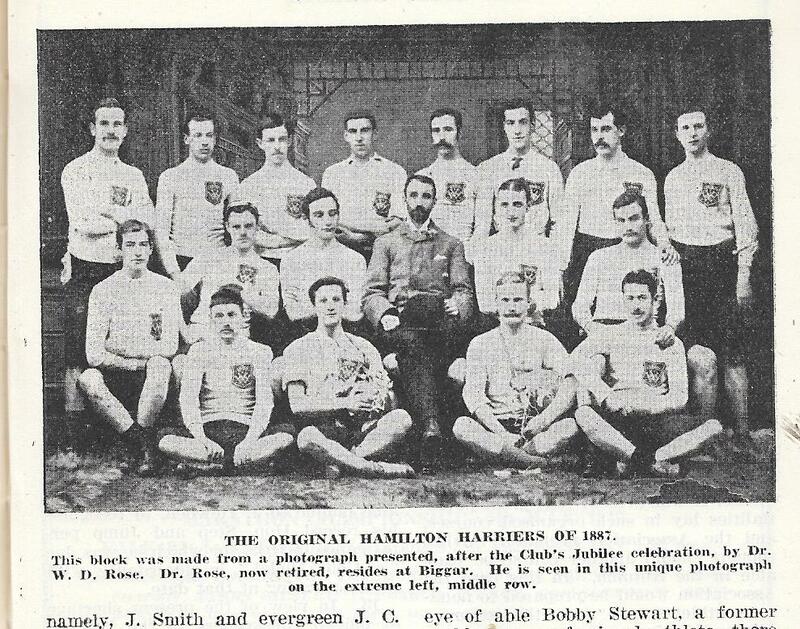 In the early days, Hamilton Harriers had many enjoyable outings with well-known County clubs which are now mostly non-existent such as the Malsely Club and the Carluke Beagles. These clubs should be remembered by older cross-country enthusiasts. Present at the Jubilee celebrations was the first club champion, J Simpson, who held the honour for two years in succession. His well-known son was the Club Champion of Motherwell YMCA Harriers a few years ago. The year 1899 was a fortunate one for the club, three business men of the town: Mr Wilson, hatter and hosier; Mre Hastie of the Black Bull Hotel; and Mr Wilson, jeweller, donated trophies for which there is still annual competition. The year 1906 was a historic one for the club. In this season they won the Western District Championship. Incidentally, T McAfferty, the winner of this race, resided in the Burgh of Hamilton but ran for Burnbank St Cuthbert’s. Also in this year, Dan Cather won the Junior Championship. This was not all, for though it is not well known, the famous Scottish athlete and Olympic 400 metres (Stamford Bridge, 1908) champion Lieutenant W Halswell joined the club this year, while stationed at Hamilton Barracks and, at the SAAA Championships, held at Powderhall the same year, he accomplished the astonishing feat of winning the 100 yards, 220 yards, 440 yards and half mile titles. One of Hamilton Harriers greatest treasures is the photo of the 1908 Olympic champion, presented to the club by Lieutenant Halswell. Hamilton had other personalities, notably Gibbie Marshall who was the uncrowned king of obstacle racing in Scotland from 1900 – 1910. WC Bell, whilst a Youth, made a great name for himself in the country as a sprinter around 1908-1912. William Roxburgh represented Scotland in the 1920 international, and, following R Devine, had the distinction of winning the club championship three years in succession from 1924. But, in 1932, the most consistent club champion of them all – James Freeland took the title, which he held continuously until 1940. James Freeland, who lost his life whilst in the RAF, had been Junior champion in 1935 and had gained international honours. News of his death came as a great blow to Hamilton Harriers and Scottish cross-country circles. Another personality is Alex Cullen – still running at 63 years of age. “Sanny”, as he is called by his club-mates, started his running activities through having an accident in a coal mine. He joined Burnbank Harriers in 1905, and was four times champion of that club. He joined Hamilton Harriers at the cessation of World War 1, and annexed the five miles handicap cup three times, the seven miles handicap four times, and the ten miles handicap ten times – a fine record. “Sanny” does not seem intent on hanging up his shoes – and so asserts the old adage “it is not how old you are, but how old you feel”. Two men have held the Presidency of the club, between them, for 40 years, namely J Smith and evergreen JC Scott who still retains office, and to whom I am indebted for most of the details of this short chronicle. Hamilton Harriers look forward to the future. AC Gibson, the presnt club champion, is only 21, and has distinct prospects. Under the watchful eye of the able Bobby Stewart, a former well-known professional athlete, there is a fine turn-out of local lads on Monday and Wednesday evenings at Douglas Park. Such coaching and training will reap its reward and Hamilton Harriers are set to be in the fore of post-war athletics. The brief history above tells us a lot about the sport when they came on the scene: for instance I had never heard of the Carluke Beagles, yet they were a respectable club who had finished sixth in the District championships and took part in all of the competitions for which they were eligible. In 1906 there were two Hamilton Harriers in the Scottish team for the international (Cather and Muirden). Sanny Cullen is another early example of a man who pre-dated the official Veteran Harriers movement by at least 30 years. The first Hamilton Harrier I came across was AC Gibson who was a Scottish international cross-country runner after the war. Lining up for a road race, he was pointed out to me as a very good runner. Indeed he was – have a look at his record. 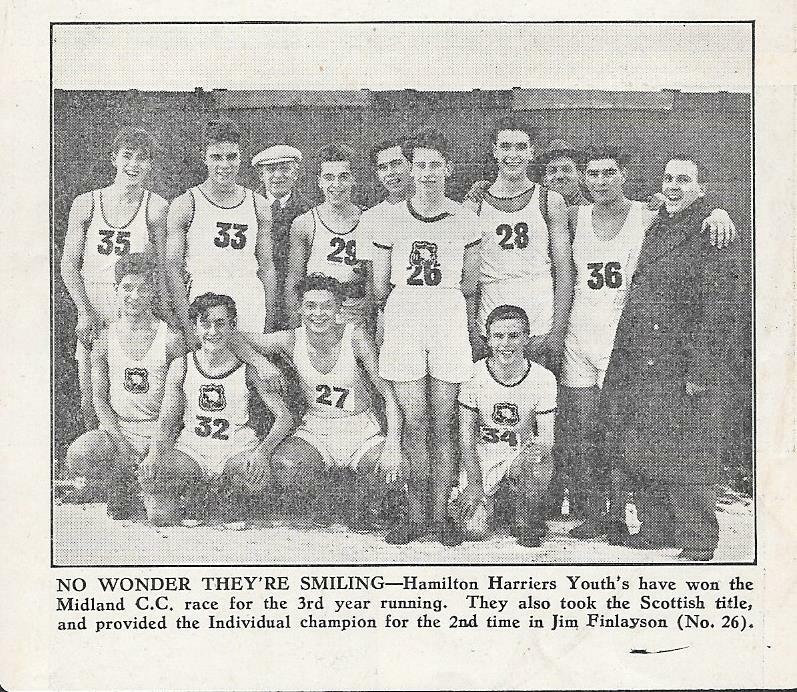 In the 1948 District Championship he was ninth and Hamilton eleventh but in the National he finished sixth and Hamilton Harriers was eleventh in the team race. Not selected for the International, he turned out in the SAAA 10 miles track championship at Helenvale in Glasgow on 24th April and finished third. In 1958/59 he missed the District Relay, the McAndrew Relay and Championships and in the National he finished 34th. The next year, 1950, Gibson was tenth in the race, the same position as he had own in the District race. His first international vest came after the 1951 National where he was seventh – it had been a good year for the man who had been fourth in the District race at Millerston. In his international debut Gibson was Scotland’s first counter, finishing 42nd and between Andy Forbes (38) and Emmet Farrell (44) . And in front of Charlie Robertson (51) and Eddie Bannon (49). He won his second vest a year later after finishing eighth and in the race, held at home on the same Hamilton racecourse he was fifty second. Two internationals – one in Wales, one In Hamilton for the man from Hamilton! He was sixth again the following year, just behind Emmet Farrell, to travel to Paris for the international. Again a counting runner he was 31st – ahead of Clark Wallace, Alex Breckenridge, Frank Sinclair and Emmet Farrell. Ninth in 1954, he was selected for his fourth and last international where he was 37th to be a scoring runner for his country yet again. In 1955 he was tenth and only just outwith the team picked. in 1956 fourteenth, in 1957 twenty first and in 1958 he was back up again at sixteenth. But he had run his last international. He was a great club man – when he started running the club was turning out teams in the national every year but for several years from the mid-fifties there was no Hamilton team at the national, merely a few runners, but he kept turning out despite offers from other clubs. He also ran in road races such as the Edinburgh to Glasgow for the club – always on the sixth difficult stage and always acquitted himself well. He was only one of four Hamilton Harriers men who represented Scotland. 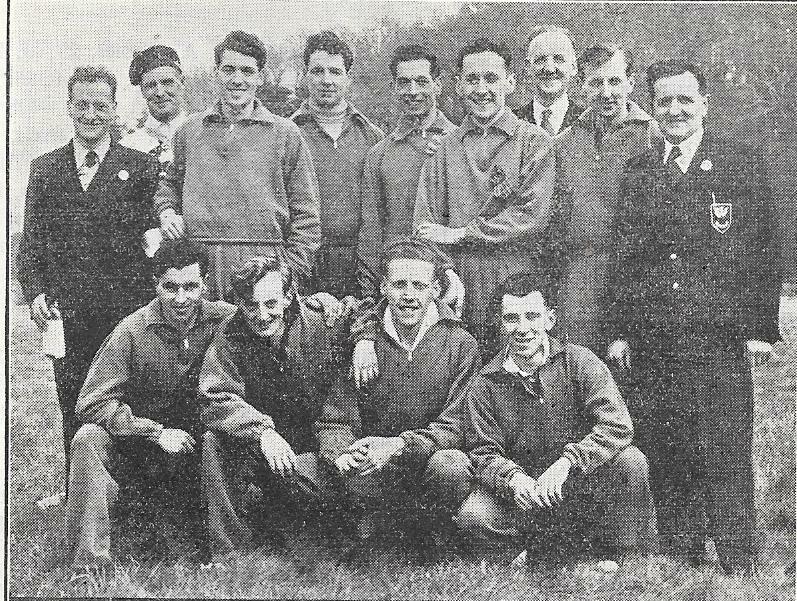 AC Gibson, fifth left in back row, between Eddie Bannon and Ronnie Kane on the left, and Joe McGhee and Tom Stevenson on the right. and in addition the three members mentioned above – Messrs Wylie (late 80’s), Robertson and Gilroy (late 90’s) all came from the club . Hamilton Harriers has a proud history and is still providing the sport with good athletes although unfortunately they all seem to move on these days. But these things go in cycles and Hamilton’s turn will come again.